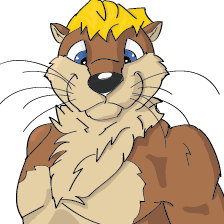 Alflor is an otterly author who currently makes his home in New England. He’s written some short stories in the past, but generally he prefers writing novels. This particular otter is responsible for The Llyran Wars series, Stories From Elton High, and several serialized novels including those that chronicle the adventures of a certain fox named Sarin Barneby. Some of the above are available from Rabbit Valley Comics, others are free to read on SoFurry and Fur Affinity.